Joey Barton thanked the Fleetwood Town fans for their support of Saturday’s matchwinner Ched Evans and revealed the forward feared a backlash from the Cod Army after the collapse of his deadline-day move to Bolton Wanderers. Loan star Evans, 30, was subject to interest from Town’s fellow League One club Sunderland and Championship Bolton last week. The striker reportedly travelled to both clubs, with Sunderland eventually spending £4m to net Wigan forward Will Grigg. Evans was then pursued by Bolton late on Thursday but his parent club Sheffield United did not activate a release clause in his contract. 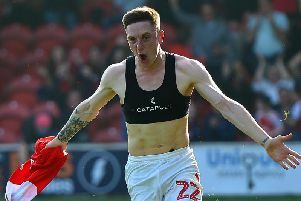 Evans, the Blades and Town all had to sign an agreement before the loan could be terminated, and Fleetwood refused to do so as they had no time to secure a replacement. Evans had agreed to end his Highbury loan, leading to Barton’s concerns he may receive a negative reception from the home crowd when Charlton Athletic visited on Satuday. But Barton was delighted by the reaction of the Cod Army and Evans thanked them by netting the only goal, his 13th of the season, in a man of the match performance. Barton selected Evans to start and said: “We had no worries at all – it was just where his head was at. Is he staying? Is he going? All that kind of thing. “Probably the person who suffered most in all of that is Ched. He is a great lad, a great team-mate and a great player. “We spoke to the senior players in the morning to make sure he was OK. They said he had come into the dressing room like nothing had happened. That is the kind of kid Ched is. “I had no doubts that if we put him in he would score the winner. He was probably unlucky not to get two, maybe three. He was denied by a good save and the width of a post. “I’m really pleased for him and delighted that the fans took to him in the way they did. He was concerned because he did not want to upset anyone at Fleetwood. “He wears his heart on his sleeve and it is important that he is supported because he does really appreciate that. Town’s goal in a much-improved second-half performance was enough to beat fifth-placed Charlton and Barton said: “I thought the lads were a little bit flat first half. We had the training week disrupted by the transfer deadline, though it probably disrupted every manager in the country’s week. “But also it had been snowing and frosty and we were limited in what we could do. “On Friday we were fortunate the groundsman did such a good job that we had an area to train on but it was not ideal preparation. “We defended correctly first half and in the second half I thought we were outstanding.